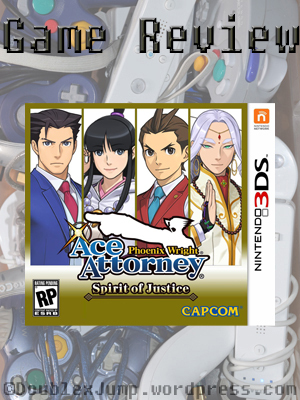 I have played some of the Ace Attorney games, but never this one. I am glad to hear it is awesome! I am not surprised, though, as the series is rock solid! It’s a great series and each individual game is just awesome. Awesome review! I loved this game, as I have with most of the series. I also didn’t like the fourth case at all. I usually don’t mind “filler” cases, but that case was just difficult to understand and not just because it was based on a very Japanese comedy style. I would have preferred it to be a DLC case, simply because it didn’t fit. The last case was essentially 2 cases in one anyway, so that 4th one was mostly fluff. I loved the 2nd case though. It’s perhaps one of my favorites and made me respect Trucy (a character I generally disliked) more. I enjoyed the final case through and through, although I wasn’t the biggest fan of the last hour of it. Maybe I had higher expectations for it, but there was missed potential. Loved the other twists in that game. And the Divination Seances were really well-done. I thought I wouldn’t like them, since I hated the (returning) Mood Matrix sequences, but they always played with your presumptions. It’s essentially the video evidence that has been present in the recent Ace Attorney games. Finally, I loved all the returning characters, with Maya being my favorite. I wish she were involved more though. Great game overall! I enjoyed the fourth case, but I was disappointed in it. I feel like they through it in there to give Athena a little spotlight (maybe because she’s wasn’t in the trial for the final case?) and also to bring back Blackquill. It definitely would have made more sense if it was DLC, especially since it was so short too. It acted like the general “first” case of the game. I’ve always loved Trucy. I find it hard to dislike any of the characters in that series, lol. I felt as though the whole game was well done mostly because of the flashbacks and references to the other games. The fourth case is most certainly just there for Athena’s sake, which is why I feel like three attorneys is too many. Two is more than enough, which is why the ending works for me. I don’t think the series is over. They can certainly continue it from there, and where Apollo ends up makes it likely that we’ll see more Divination Seances in the future. Plus, I’m pretty sure the DLC takes place after the game anyway (I believe), so there are opportunities to keep it going. I think they added Athena to throw in another girl who is an actual lawyer and not an assistant. I do love Athena, but she does seem like she was thrown in for that sort of variety. I’m pretty sure the games aren’t over (they’d be dumb if they decided to stop, lol) because we need to continue Phoenix and Maya’s story, and now we need another Apollo game to follow him. And I also want a separate game for Athena. She and Blackquill have a deep connection and I want to see more. We don’t know much about Athena so we need some backstory for her. I agree. And I don’t hate Athena, but I don’t think she bring much to the series. She had a pretty good story in Dual Destinies, but I don’t think her return is justified here. She’s just there to use the Mood Matrix, which is one of my least favorite parts of the game. It’s usually obvious what emotions people should be having during situations, so it doesn’t add much, even in the case that actually dealt with psychological issues (incorrectly, I might add). I want more Phoenix and Maya, and I wish that the game had more of them together. I’m glad the DLC case at least has them back to their usual selves. As for Athena, I’d be fine with more story, especially since we got Apollo backstory finally. Though I’d say the Dual Destinies backstory for her was sufficient. I guess what I want most from the AA series is a new proper Phoenix Wright only entry. I can agree about the Mood Matrix. Between Spirit Channeling, Apollo’s bracelet, and now the Divination Seances, the Mood Matrix is the one that brings the least to the table and it is the easiest. Honestly, I haven’t played Dual Destinies in a while so I don’t really remember. I have to replay the whole series anyway. It’s somewhat sad for the Mood Matrix when looking for a person’s nervous tic is more satisfying than it, haha. But the Switch is going to be more than enough before the next Ace Attorney game. In fact, maybe the next AA game will be on the Switch! I’d be so happy if that were the case. Can’t wait for you to finally get the Switch! Enjoy! The nervous tic can be hard, lol. I would love for an Ace Attorney game to be on the Switch! We found the original trilogy through the Wii Ware, not knowing they were DS games. So we played them on our TV. Now we have to huddle together on one of our 3DS’s… Plus, our other sister (who doesn’t play video games) played the original trilogy with us on the TV. She absolutely loved it and it was great to solve the puzzles together. I can’t wait to get my hands on the Switch! But I’m so worried it’s going to take over my life… April is a busy month without the new video games, lol.